PM2.5 laser dust sensor is a digital universal particle concentration sensor，it can be used to obtain the number of suspended particulate matter in a unit volume of air within 0.3 to 10 microns, namely the concentration of particulate matter, and output with digital interface, also can output quality data of per particle. The Air Quality sensors can be embedded in a variety of concentrations of environment-related instruments suspended particulate matter in the air,to provide timely and accurate concentration data. Voltage ripple: less than 100mV. 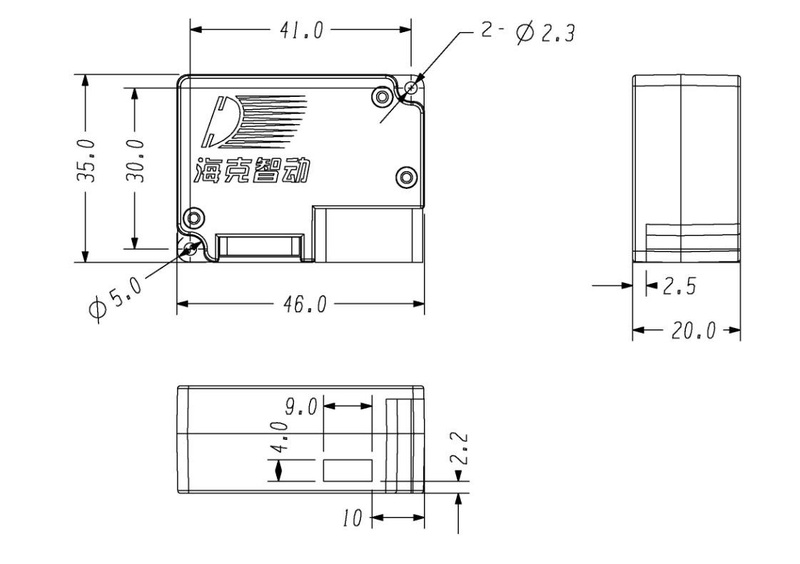 The power supply voltage stability: 4.95 ~ 5.05V. Power supply: more than 1W (5V@200mA). The upper and lower electric voltage surge is less than 50% of the system power supply voltage. **SET: ** SET = 1, the module works in continuous sampling mode, it will upload the sample data after the end of each sampling. (The sampling response time is 1S) SET = 0, the module enters a low-power standby mode. RESET: leave it empty is OK. 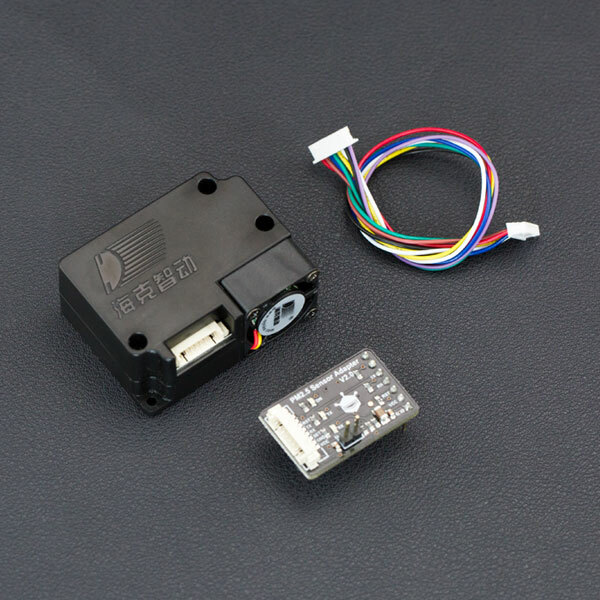 If you have an IO expansion shield, you can simply insert the PM2.5 sensor adapter onto it, and you can use the serial to monitor the data. 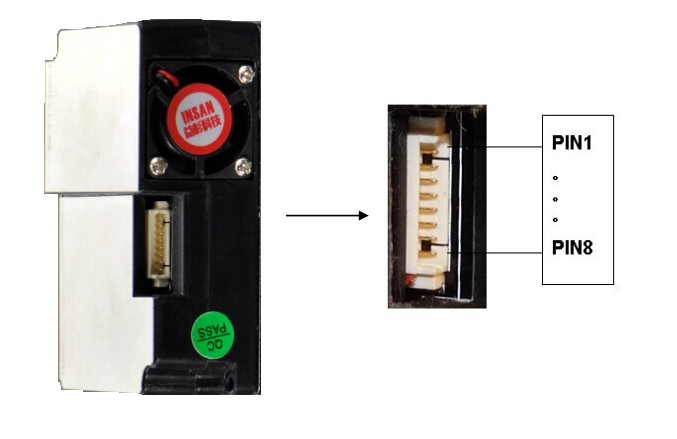 If you have no IO expansion shield, you can follow the wiring diagram to do wiring. NOTE: This code can only be verified in ArduinoIDE 1.6.x or above. NOTE: The following code uses Software Serial. Please wait 30s for the data. 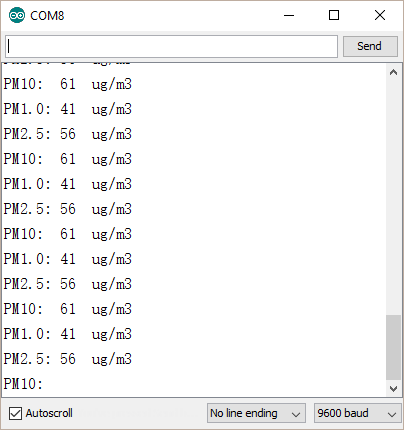 Serial port baudrate: 9600; Parity: None; Stop Bits: 1; packet length is fixed at 32 bytes. 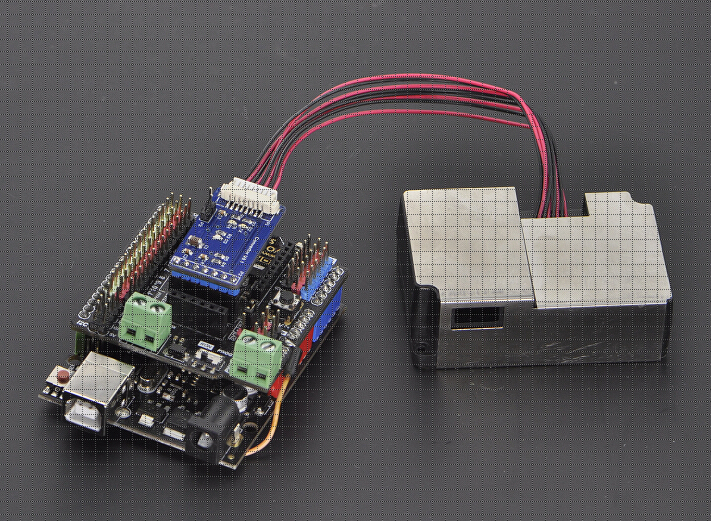 Get Laser PM2.5 Air Quality Sensor For Arduino from DFRobot Store or DFRobot Distributor.